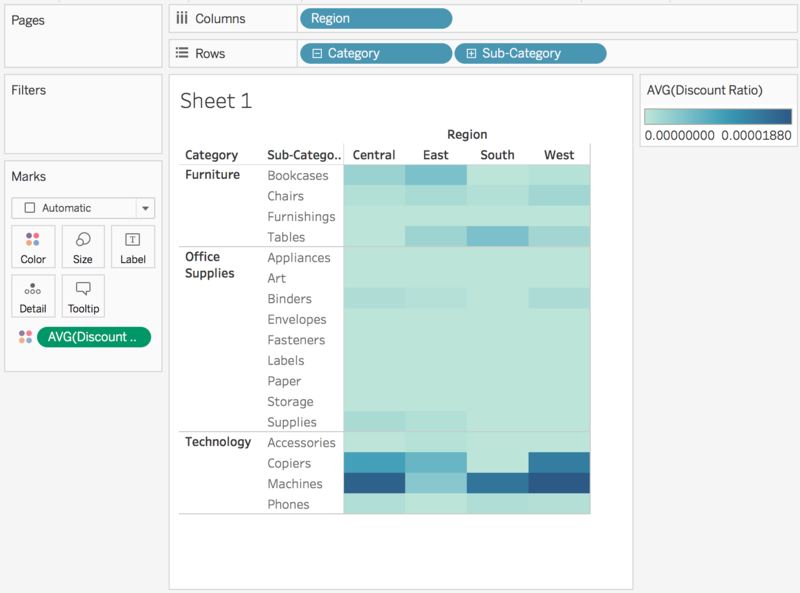 This article describes how to create and use calculated fields in Tableau using an example. You'll learn Tableau calculation concepts, as well as how to create and edit a calculated field. You will also learn how to work with the calculation editor, and use a calculated field in the view. If you're new to Tableau calculations or to creating calculated fields in Tableau, this is a good place to start. Calculated fields allow you to create new data from data that already exists in your data source. When you create a calculated field, you are essentially creating a new field (or column) in your data source, the values or members of which are determined by a calculation that you control. 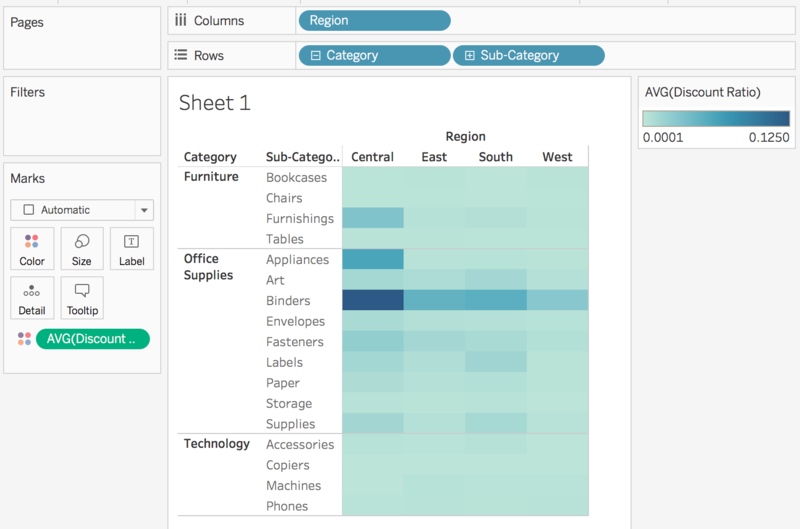 This new calculated field is saved to your data source in Tableau, and can be used to create more robust visualizations. But don't worry: your original data remains untouched. To convert the data type of a field, such as converting a string to a date. Basic calculations - Basic calculations allow you to transform values or members at the data source level of detail (a row-level calculation) or at the visualization level of detail (an aggregate calculation). Level of Detail (LOD) expressions - Just like basic calculations, LOD calculations allow you to compute values at the data source level and the visualization level. However, LOD calculations give you even more control on the level of granularity you want to compute. They can be performed at a more granular level (INCLUDE), a less granular level (EXCLUDE), or an entirely independent level (FIXED) with respect to the granularity of the visualization. For more information, see Create Level of Detail Expressions in Tableau. Table calculations - Table calculations allow you to transform values at the level of detail of the visualization only. For more information, see Transform Values with Table Calculations. The type of calculation you choose depends on the needs of your analysis and the question you want to answer. Once you have determined the type of calculation you want to use, it's time to create a calculated field. This example uses a basic calculation. 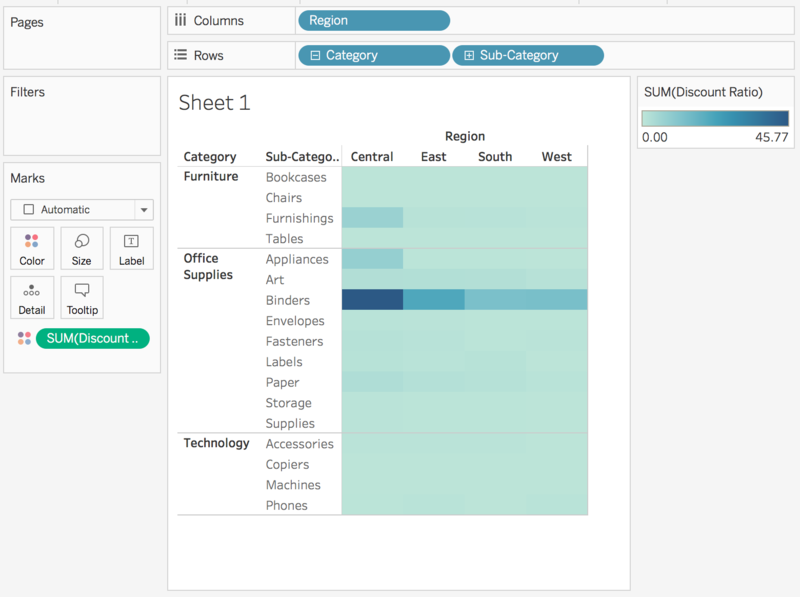 Note: The example in this article uses the Sample-Superstore data source that comes with Tableau Desktop. To follow along with the steps in this article, connect to the Sample-Superstore saved data source and navigate to Sheet 1. In Tableau, select Analysis > Create Calculated Field. Enter a name for the calculated field. In this example, the field is called, Discount Ratio. This formula checks if sales is not equal to zero. If true, it returns the discount ratio (Discount/Sales); if false, it returns zero. To see a list of available functions, click the triangle icon on the right-side of the Calculation Editor. Each function includes syntax, a description, and an example for your reference. Double-click a function in the list to add it to the formula. For more tips, see Tips for Working with Calculated Fields in Tableau. 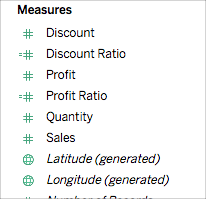 The new calculated field is added to Measures in the Data pane because it returns a number. An equal sign (=) appears next to the data type icon. All calculated fields have equal signs (=) next to them in the Data pane. From Dimensions, drag Region to the Columns shelf. From Dimensions, drag Category to the Rows shelf. 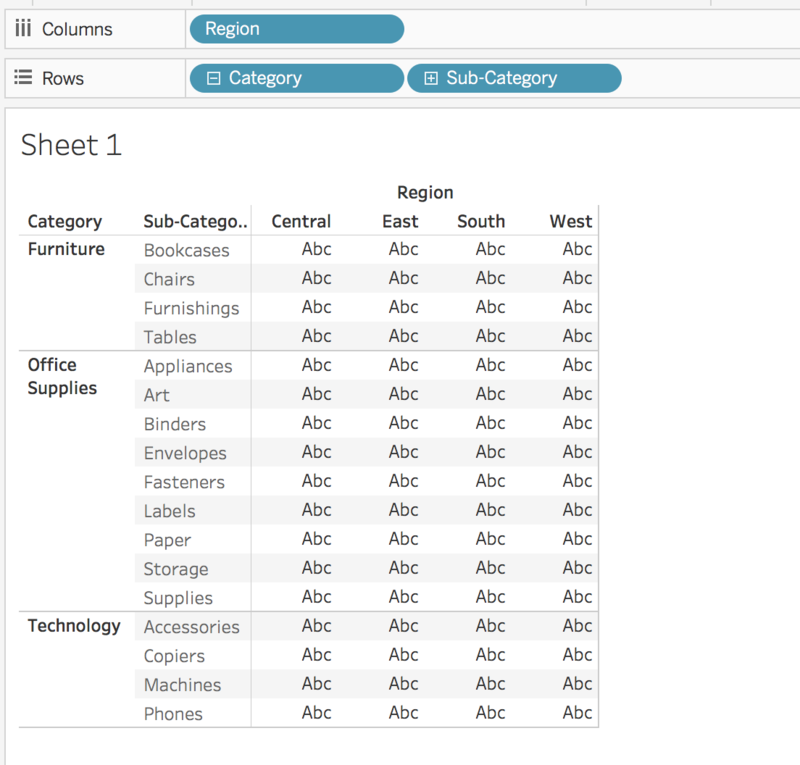 On the Rows shelf, click the plus icon (+) on the Category field to drill-down to Subcategory. From Measures, drag Discount Ratio to Color on the Marks card. The view updates to highlight table. You can see that Binders are heavily discounted in the Central region. Notice that Discount Ratio is automatically aggregated as a sum. On the Rows shelf, right-click SUM(Discount Ratio) and select Measure (Sum) > Average. The view updates with the average of discount ratio shown. If at any time you need to change a calculation, you can edit the calculated field and it will update across your entire workbook. In the Data pane, right-click the calculated field and select Edit. Edit the name of the calculated field. The view updates to reflect the changes automatically. You do not need to re-add the updated calculated field to the view.